My Fiance and I had recently discovered that we were expecting a baby and decided it was finally time to look for our first home. During our third house viewing with no luck, we met Cynthia and decided her energy was a great match for us. Naturally as a first time home buyer, we had no idea what we were doing and with that we had a thousand questions that Cynthia was always willing and eager to answer. We found her to be energetic and friendly - yet very professional. We strongly believe that working with her made our house buying experience much more enjoyable and easy. When we finally found a home for our expanding family, I think she was just as excited as we were! We have never met a working professional who truly cares as much as she did - it was very refreshing! Thank you so much Cynthia, it would not have been the same journey without you! When we decided to look into purchasing a home in Fredericton while still living in Ottawa, we weren't sure where to start. We were recommended to Cynthia & Pierre and after contacting them we felt very comfortable with our decision. Buying your first home can be quite a stressful experience, but Cynthia & Pierre made us feel as relaxed as possible! Most of our communication was done by e-mail and telephone and they were very prompt and helpful with answers to our (many) questions. They made things easy and organized for our short weekend trips to look at places. Cynthia is one of the most enthusiastic people I have ever spoken with and after closing our deal, we have been made to feel like old friends. We would highly recommend Cynthia & Pierre to anybody looking to buy a home in Fredericton! During the Winter of 2011, my husband and I visited an Open House where we first met Pierre & Cynthia Charron. We instantly hit it off with the "Dynamic Duo!" As first time home buyers, we were uncertain about what type of home would best suit our needs. They were both very helpful during the whole process; they listened to our needs and wants, respected our wishes, and returned our many e-mails and phone calls promptly! We were planning our wedding at the same time as we were house shopping but Cynthia did not let us worry about the home buying process. She took care of all of the details and made the entire process as stress and worry-free as possible. She was able to recommend us to the right mortgage broker, home inspector, and lawyer. They were by our side every step of the way; from Open House to Closing Day! Now that we have moved into our home, the service has not stopped. Cynthia & Pierre have made sure that we are happy with our purchase and are always willing to follow up with any of our concerns. Their service, friendliness, and generosity is second to none. We would highly recommend Pierre & Cynthia as Real Estate Agents to any of our friends and family. They helped us find the perfect first home and we are certian they can do the same for you! Cynthia & Pierre were very good to us and dealing with our sale and purchase. From day one, they were very knowledgeable, experienced, and understanding. Our house was sold within ONE DAY! They helped us with our decision when we had a couple of choices to choose from and ensured we made the choice that best suited our needs. We are very pleased with our new home and we are happy with our choice! We highly recommend the Dynamic Duo! I have bought and sold with Cynthia and Pierre over the years, and each time is a great experience! Their knowledge of the market, thoroughness and professionalism, not to mention their warm personalities make buying and selling so easy! I've recommend them numerous times and I always look forward to working with them! We first became acquainted with Cynthia & Pierre when they sold the house across the street from us in 2 months. When it was time for us to list our home, we knew we wanted Cynthia & Pierre to do the same for us. Cynthia was fabulous in keeping us informed every step of the way and our home sold in record time. Then, Cynthia helped us find our new home which is perfect for our family. She was so helpful in suggesting the right people to help make this transition smoother. We would definitely recommend Cynthia & Pierre to anyone looking to buy or sell a home! Nous avons d'abord fait la connaisance de Cynthia & Pierre lorsqu'ils ont vendu une maison voisine à la notre, en seulement 2 mois. Lorsqu'il fut temps pour nous de mettre notre maison sur le marché, nous voulions que Cynthia & Pierre fassent de même pour nous. Cynthia était fabuleuse; elle nous informait à chaque étape du processus et notre maison s'est vendue en un temps record! Ensuite, Cynthia nous a aidés à trouver notre nouvelle maison, qui est parfaite pour notre famille. Elle a été très serviable et nous a suggéré les bonnes personnes pour faciliter la transition. Nous recommandons sans hésiter, Cynthia & Pierre, à ceux qui désirent vendre ou acheter une maison! À l'été 2012 nous avons donné le mandant de vendre notre maison à Pierre Charron. Tout au long du processus, qui peut être stressant par moment, Pierre a toujours été présent pour répondre à nos questions. Il retournait nos appels très rapidement. Lors de la transaction finale, il a négocié la vente avec nous en respectant nos demandes et attente, dans un contexte où le marché était au ralenti, et nous en sommes très reconnaissants. Vous voulez vivre une expérience positif et dynamique, n'hesitez pas à le contacter. We highly recommend Cynthia and Pierre. They helped us sell our home (which they helped us purchase 7 years ago) and buy a new home that fits us perfectly! They are very professional, they take time in the beginning to get to know you and make a plan that fits your situation! They are always available to answer questions and their combined experience allows them to provide valuable feedback and good advice. And even when the going gets tough and nothing seems to be happening, they are there for a pep talk to lift the spirits! Thank you Cynthia and Pierre! We couldn't have done it without you Cynthia & Pierre! Your very professional work ethic, strong confidence and determination made us feel that we were able to get what we wanted - and we did! In the market the way it is today, we weren't sure what we were going to get. We appreciated your honesty and willingness to answer every question we had. You were there for us every step of the way! Thanks again for everything Cynthia & Pierre - it really means a lot to us! We look forward to dealing with you again in the future! 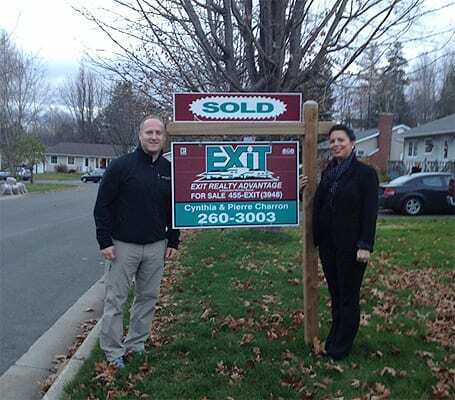 My wife and I chose Cynthia and Pierre Charron of Exit Realty Advantage to represent us in the sale of our house. I must agree that this couple lives up to their “Dynamic Duo” moniker. We found them to be frank and up front with the sellers and they provided an excellent marketing strategy for the sale of our house. They kept us informed of any feedback received from every viewing and were very helpful throughout the sale process. We would not hesitate to enlist their expertise again and would highly recommend them to family and friends. Thanks so much to Cynthia & Pierre Charron of Exit Realty Advantage for helping me with the sale of my home and the purchase of my dream home. In a tough real estate market, their energy and enthusiasm was evident from day one. They kept my spirits high throughout the process and their professionalism and realistic approach gave me confidence that I was making the right decision. They took the time to get to know me and understand what I was looking for, I knew they had my best interests above all else. They were always available for a quick chat and they worked tirelessly to help me sell my home and find my new home. They turned what could have been a highly stressful experience into something enjoyable and exciting. Cynthia and Pierre truly are The Dynamic Duo!! Nous avons rencontré Pierre alors que nous étions à quelques semaines d'accueillir notre deuxième enfant et de déménager dans une ville principalement anglophone qui nous était inconnue. Nul besoin de mentionner que sa connaissance du marché, sa disponibilité, son bilinguisme et son professionnalisme ont été grandement appréciés. Il s'est rendu disponible à des heures impossibles, il nous a partagé de judicieux conseils et il a fait un suivi incomparable suite à l'achat de notre maison notamment en retournant sans délai mes nombreux courriels. Sa femme et lui sont même venus nous saluer dans notre nouvelle maison peu après notre déménagement. Bref, il a su faciliter cette étape importante de nos vies en faisant preuve d'une grande humanité au point où aujourd'hui, nous le considérons comme un ami. Merci pour tout, Pierre. Pierre and Cynthia did the most AMAZING job helping us find our new home here in NB. They worked tirelessly for us, even communicating with us about our house while they were out of town attending a conference. They were knowledgeable of the area, honest, kept us on task, and helped us get the best deal on the perfect house for us. Amazingly kind and sharing of both their time and experience, I would wholeheartedly recommend this dynamic duo to anyone looking for a home in the Fredericton area. Thanks ever so much guys- you rock! I first met Cynthia Spring 2018 and she is a most wonderful and professional woman. And she has the most welcoming nature! She was patient with me and my pointed questions and direct opinions and so sweet to my children while looking at houses! When she was sick on my closing she sent her husband who took sooooooo much time to go over every part of the house with me to make sure I was getting everything I asked for and that I was satisfied with the condition of the house. I felt extremely well taken care of! At Thanksgiving they drove around giving pumpkins to friends and clients - and this was months after I closed! A warm and caring and professional couple, they will always have my business! J’ai communiqué avec Cynthia sous la recommandation d’une amie; je n’ai pas été déçue! Cynthia est très dynamique, connait très bien son travail et semble être disponible 24 heures sur 24! Ses conseils sont le fruit d’années d’expérience, ça se sent! Et quelle efficacité! Thank you so much! Having lived in our home for over fifty years, we were reluctant to move forward with the sale of our home. We were very fortunate to meet Cynthia while attending one of her open houses. We were immediately impressed with her kind personality and her sincere and professional approach. Cynthia was very reliable and the whole experience went as smoothly as one could possibly hope. We would highly recommend the "Dynamic duo". Cynthia and Pierre sold my house for me last spring for a fair price in a sluggish market. I really enjoyed working with them! They were organized and accessible, as well as strong strategists. I've been to Open House that they've hosted...they treat everyone's home, no matter how humble, as if it were a palace. And, they're lovely, fun people! I wouldn't hesitate to work with them again the future! I bought 68 Rose court with Cynthia. An easy transaction. Thanks for the pumpkin! Both my husband and I would like to take this opportunity to Thank Pierre and Cynthia for all they have done for us....their steadfast approach and personal touch were key in selling of our home, especially in such a depressed market. They really went to bat for us in the negotiating process and we can't thank or recommend them enough! Cynthia you ROCK...LOL you too Pierre! We were moving back to Fredericton from Halifax and asked Cynthia & Pierre to help us find a perfect home. Since we were moving from Halifax, we only had one weekend (which was Thanksgiving Weekend) to look for our new home. Cynthia & Pierre took the time from their busy schedules and set up appointments at numerous houses for us. We were very pleased by their down to earth personalities, their knowledge of Real Estate and the many pointers they gave us along the way. Thanks again Cynthia & Pierre! - Cynthia & Pierre are extremely personable and handle any issues that arise in a professional manner. - We always felt that we were well informed and kept in-the-loop during the entire Real Estate transaction. - They sold our home, which was a diffilcult sell as it was a very unique property. In summary, we would not hesitate to refer them to our family and friends, and would definitely choose them as our realtors for future business.